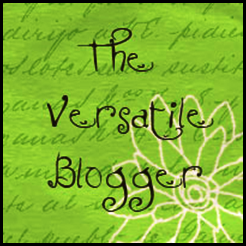 ← Privacy, or the Lack Thereof! As I told you in an earlier post, Catching Up, we have been in the process of moving from our old house to a house in the town where I work. I’m not ready to take pictures of the inside yet as it stands now, since we’re still working on it, but I thought I’d share the following pictures I took of the house when we were looking at it, deciding whether we would rent it or not. 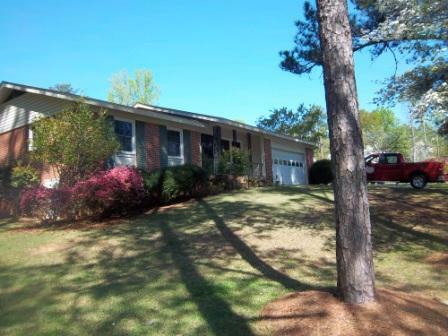 Our New House, a view of the front yard and front of the house. I was extremely fortunate to get to look at the house when some of the spring flowers were still blooming. Here is a view just of the front yard from the side of house. The dogwoods were still in bloom. One of the best things about the front yard is the number of trees that are in it. 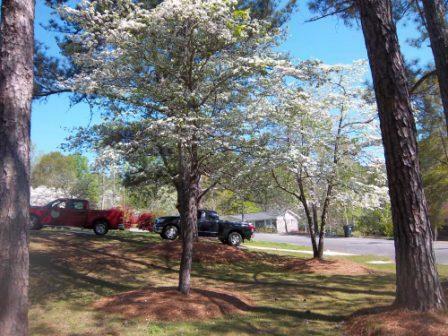 The trees in the front yard include several very tall pines, as well as the dogwoods and then a mix of hardwoods off to the left side. Here is the first room in the house, at least for company. The door standing open is the front door of the house. We are using it as a living room/den. 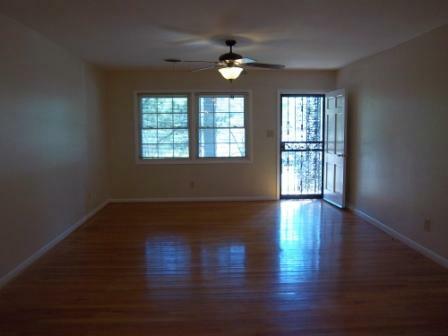 The wooden floored portion of the house gives way in the dining room to linoleum. 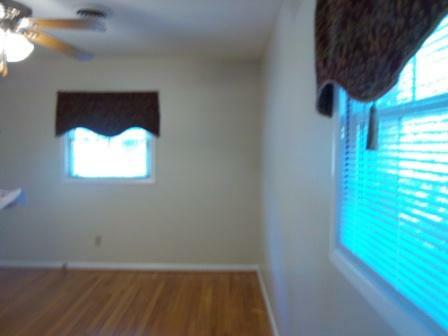 This is a view of the dining room from the kitchen. 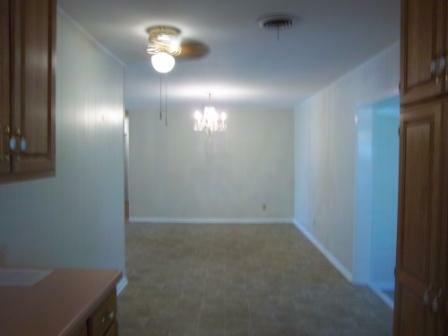 In this picture, the living room would be just to the left of the dining room. 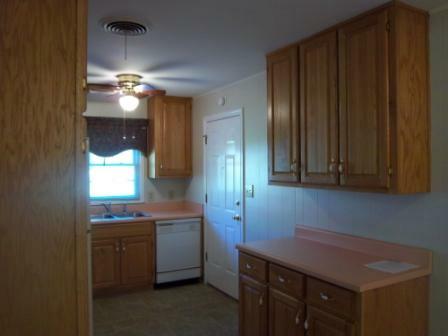 Here is one view of the kitchen. While it is small, it has a lot of cupboard space for its size, as well as a full complement of kitchen appliances. 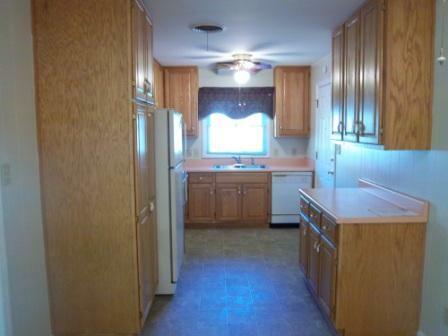 In this second view of the kitchen, you can see the door leading out to the garage over on the right. 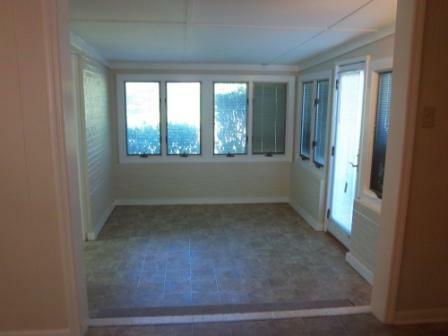 One really nice feature of the house is the sun room. To reach it, you go straight through the living room and dining room from the front door, then walk down one step. 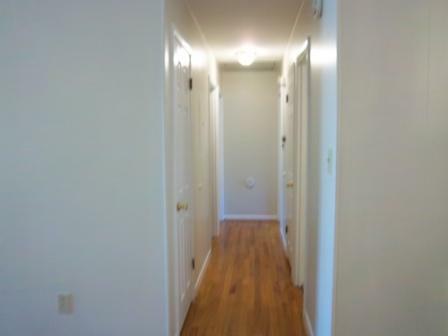 The door to the right leads out to the back yard, while the door on the left leads into the laundry room. 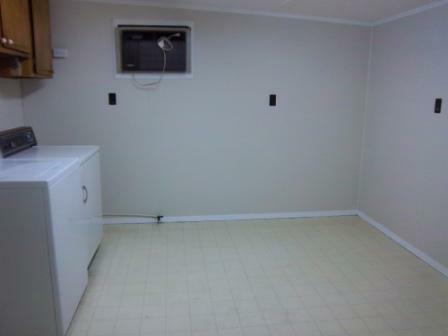 One unusual feature of the house is this huge laundry room. I have never seen one so big before! I have wondered why the people who added the laundry room to this house made it so big, but have no answers to that question. Let’s go back to the living room, and turn down the hallway that leads to the bedrooms and bathrooms. 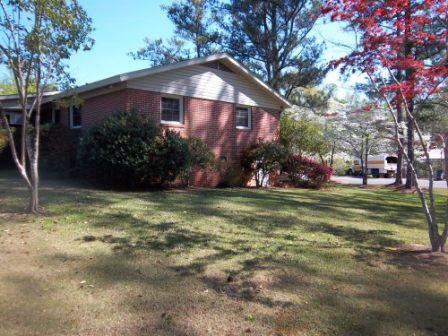 There are three bedrooms, and two bathrooms, plus a coat and linen closet. 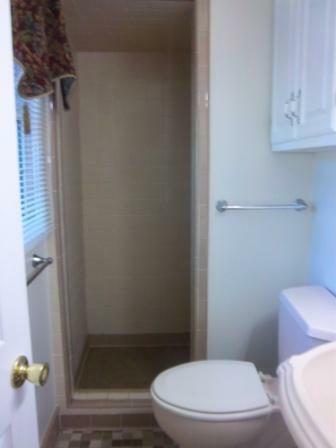 I never got a good picture of the whole hallway bathroom, but here is a picture of the incredibly tiny miniscule no room to turn around in adorably cute postage stamp sized master bathroom, so-called because it is off of the largest bedroom. 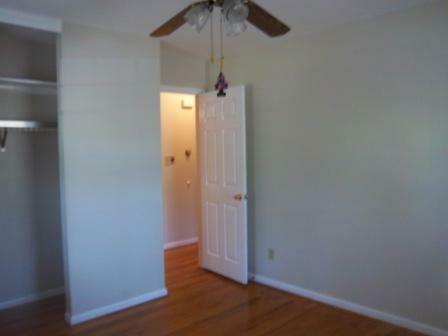 Here is a picture of the second biggest bedroom, which is Kayla’s. The third bedroom is much the same, only smaller, so I will save the picture space and journey onward to the back and side yards. 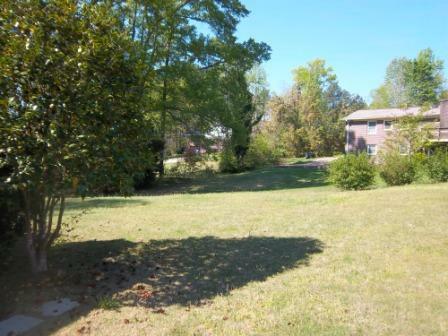 Here is a picture of the back yard, which is very large. This picture above was taking from the sunroom door looking toward our back neighbors. The back yard is huge! Even better, since this picture was taken, it also has had a wooden privacy fence installed in it, so the dogs are where they can go outside and play, even Tyra. The picture above finishes the tour. It shows the side of the house without the garage. And that, ladies and gentlemen, concludes our tour. Thank you for traveling with WMA (“Working Mom Adventures) tours, and please, as you exit the vehicle, secure all your stray belongings and grasp small children firmly by the hand! This entry was posted in On the Home Front, working mom and tagged dogs, family, HGTV, home photographs, House, Househunters. Bookmark the permalink. It looks great Nancy. I love the trees and the large size of the yard. Very, very nice house. I am sure you will be very happy there. Thanks! The “move-in/where does everything go” part of the move is always the longest! I can’t wait to see the pictures of your home. Enjoyed the WMA tour. I got the kids i hand, and most of my belongings, but can’t seem to find my hat … could you check to see if I left it in one of your boxes? Nice! Thanks for the tour…blessings to your family in your new home. It looks lovely! FYI – such a fan of Househunters and Househunters International… sometimes I can catch a HH Int. on cable here, but I’m still sadly deprived. Can’t wait for more photos! I can’t imagine not having Househunters to turn to when everything else on our 100+ available channels for viewing fails us. You have my sympathies! Its always fun to try and guess which house the people will buy, and compare it to the house you would buy.